Our returning guest columnist David Stickland gives a detailed overview, from a statistical vantage point, why teams of three riders would make for a better Olympics. Eurodressage also believes that the Olympics should not only be about the best riders, but also about having the biggest global representation possible. Stickland supports this view and explains why. At the upcoming FEI Sports Forum in Lausanne, a proposal lies on the table to change the Olympic teams back to four riders with a scratch score, but the only countries who would actually benefit from this rule are the strongest dressage nations in the world (Germany, Holland, Great Britain, etc.). At the 2012 Olympics teams of 3 were sent to London, but countries could earn an individual fourth spot. In the end it turned out to be that those individual spots went to the strongest nations and with only three riders allowed to compete in the Kur the fourth spot was lost for individual medal contention anyway. Check out Stickland's explanation why teams of three would be better for the image, globality and fairness of the sport. 3. A Nation can send at most 4 riders who form a Team with the lowest score dropped. Other Nations may qualify only 3 riders and hence have no score to drop. I suggest that scenario 3 is inequitable; the top nations have a clear bias in their favor in that they can afford mistakes or injuries without compromising their medal possibilities. Such an advantage does not go to the 3 member teams. To the best of my knowledge, in the 4x100m relay, no nation gets a dropped time if one of their runners trips up? Having a reserve combination makes a lot of sense until the last moment before the test starts as we have two athletes (rider & horse) who could for some reason be unable to start, but if a couple makes a mistake or gets eliminated - isn’t that sport? Scenario 3a is also a bit contrived and unlikely to be adopted; if a Nation were to qualify 3 members they would surely want to participate as a Team even if at a disadvantage compared to the 4 member teams, and the more 4 member teams there are the fewer nations will be able to participate at all! I have used the most recent World Dressage Ranking List published by the FEI (FEI World Individual Dressage Ranking - N° 146 - 28/02/2013) to get some insight into the numbers and to understand the likely impact on the globalization of the sport of having 3 or 4 member teams. This is not quite the same as using the more likely proposal of Championship winners and Regional quotas, but it gives a pretty good picture of the eventual final selection - and I “guarantee” that the Championship selected teams would appear in either approach. I also consider two additional variants that are on the table at the Sports Forum; 50 or 60 starters in Dressage. Finally, I assume we must select at least one rider (national place) from each of the 7 FEI regions, and because the Host Nation always qualifies a team in any Olympic discipline, in this case Brazil in Region E, this means that either 41 or 51 other places remain to be selected. One must keep in mind that in the Olympics no actual person is selected by the selection system; slots are allocated to National Olympic Committees who can then assign them as they wish providing that the selected combination respects any other qualification criteria such as minimum scores etc. 3. Select the top ranked rider from every region and then remove them from the list. In the table I show these scenarios, I have assumed in all cases that Brazil, the Host Nation, sends a 3-member team. For shorthand I refer to the different scenarios as 50&3 (50 riders, maximum of 3 per nation), 60&3, 50&4, 60&4. By the way, the lowest ranked “selected” (not regional quota) rider in the 60&3 scenario, has still achieved twice a score in excess of 67% in the last 12 months, so this is by no means a selection that undermines the quality requirements of an Olympic Games. Individual riders are still of course selected. For example, in the 60&3 case four nations have 2 riders and four nations have 1 rider for a total of 12 Individual competitors. F - Africa & Middle East; G - South East Asia, Oceania. In the second table I show how these regions would be represented in the different scenarios. Not surprisingly the 60&3 scenario yields the largest number of competing teams (16), while the 50&4 scenario, the smallest (10). The 60&3 scenario also succeeds in having representation from all regions and participation of riders from 24 of the 43 possible Nations. Either scenario with teams of 4 permitted maximizes the number of Western European riders with an average of 70% of the starters coming from the combined A+B region. 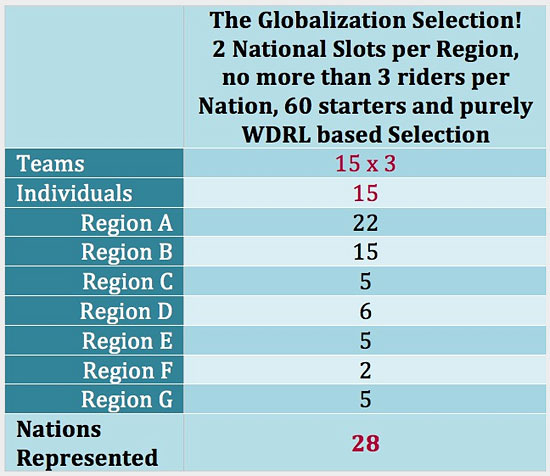 It is worth noting that this division between the regions is also representative of the WDRL itself, considering the top 100 riders (removing second and third mounts) the breakdown is: A 56%, B 15%, (A+B 71%), C 5%, D 17%, E 0%, F 0%, G 7%. The 60&3 scenario if run on todays WDRL would select riders from these nations: AUS, AUT, BEL, BLR, BRA, CAN, DEN, ESP, FIN, FRA, GBR, GER, IRL, ITA, JPN, MAR, NED, NOR, POL, POR, RUS, SUI, SWE, USA where the Teams are shown in Bold. I think this would be a wonderful situation for International Dressage. Fundamentally the choice of Team size comes down to a choice of retaining just the top riders – and this can be achieved by allowing 4 member teams that will be also mostly populated by EU and NA nations - or accepting that some of the very top riders in those regions do not go to the Olympics, but those extra places go to well placed, but not very top, riders from the rest of the World – and this can be achieved by limiting teams to 3 riders. In the (50&4) scenario, only 10% of the riders would come from outside EU and NA, while in the (60&3) scenario 25% of them would be from the rest of the world. Probably none of these choices affect which Teams will win the medals, nor which Individuals, but the restriction to 3 members per team broadens the participation and raises from 11 in 2012 to a potential 16 in 2016 the number of nations in the Team Competition – and every news service in the world reports on its Team participations even when they are not the winners. How could you make the selection even more globally balanced? Instead of allocating one slot from each region, allocate a slot to the top 2 nations in each region! Testing this on the 60&3 scenario we would then end up with 15 Teams and individuals from a further 13 nations with 1 or 2 riders for a total of 28 nations participating. (Out of the 40 that field any International riders in Dressage today.) With a regional breakdown of: A 37%, B 25%, (A+B 62%), C 8%, D 10%, E 8%, F 3%, G 8%. In this way 28% of the participants would not be from Western Europe or North America, a new high in Globalization of the sport. Finally a personal note about selection criteria; historically the initial Team selection is by success at World and Regional Championships. What I have seen from my exercise with selection only from the WDRL, is that this works just as well and puts every country on the same footing for Team selection. Why use this system? Because it does not take pages of legalese to describe it (and thus employment for lawyers arguing that it has not been respected) and every country has in principle the same chance. Of course the countries with 15 riders in the top 100 are still going to be the most likely to qualify a team, but the playing field is demonstrably a level field as far as the rules are concerned, the only criteria now will be sporting success. Every rider and nation has to do their best to be at the top of the list, isn’t that sport? No free rides.